The Old Philippines was created as a page for everyone who wishes to relive the excitement of the "Old Philippines." Your precious memories live on here... I post them here with as much detail I can get out of the photographs for anyone but most especially for the rightly proud and gracious people of the Philippines. So they can remember the beautiful glory days after the turn of the century when The Philippines was known as the Pearl of the Orient. I hope some of these photos are interesting and useful to those who know and love the Philippines. Remembering The Beautiful Glory Days Of The Philippines When It Was Known As The Pearl Of The Orient. A Walk Down Memory Lane..
Binondo Church is located in Manila's Chinatown at the western end of Ongpin Street, Binondo. This church was founded by Dominican priests in 1596 to serve their Chinese converts to Christianity. The original building was destroyed by a bombardment by the British in 1762 during their brief occupation of Manila at that time. The current granite church was completed on the same site in 1852 and features an octagonal bell tower which suggests the Chinese culture of the parishioners. 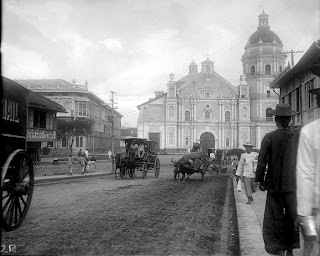 Binondo Church was greatly damaged during the Second World War, although fortunately the western facade and the octagonal bell tower survived. Binondo Church is also known as the Minor Basilica of San Lorenzo Ruiz. It was named after the sacristan, San Lorenzo Ruiz, who was born of a Chinese father and a Filipino mother, trained in this church and afterwards went as a missionary to Japan and was executed there for refusing to renounce his religion. San Lorenzo Ruiz was to be the Philippines' first saint and he was canonized in 1989. A large statue of the martyr stands in front of the church.